I took a look today and realized that I never posted my finished quilt top and quilt back for my Double Wedding Ring Quilt. I’m not sure how that happened. 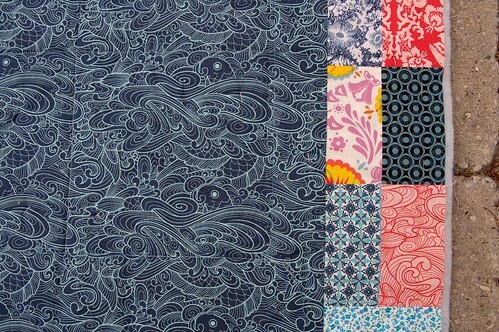 I love looking at this quilt, the colour combination still delights me. For the backing I used the submarine print from Tula Pink’s Neptune collection and then scrapped together the leftovers from the border and the rings. It’s amazing how quilting projects can stretch out in time. 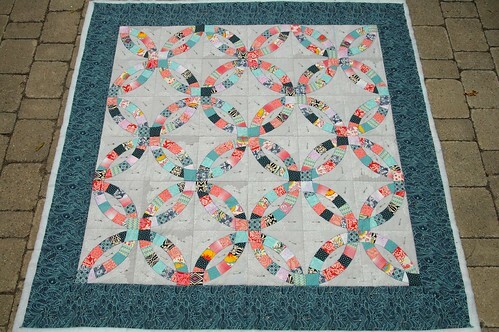 When I started making this double wedding ring quilt, I thought I’d be done in no time. What on earth was I thinking? I was able to put the entire thing together and get it basted during the four week class. I was undecided about the quilting though. 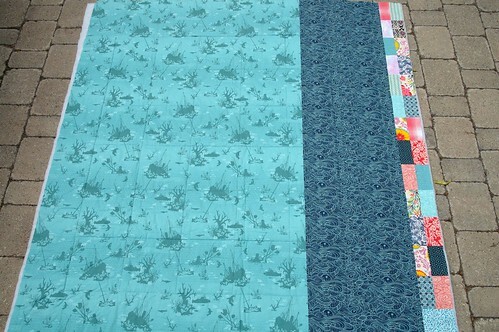 I machine quilted around the blocks and then debated if I should continue on the machine or try to hand quilt. I couldn’t decide, so I took a ‘break’ from the project instead. In the meantime, I’ve been working on hand quilting my queen-sized quilt. Slowly. I am getting better, at least. My stitches are not perfect or even, but at least they are shorter. I’ve been experimenting with using the small little inbetween needles and I’m now using the smallest ones – size 12. In the beginning I did not understand the purpose of these teeny tiny needles, but now I’ve seen the difference in stitch length it can make. The other night, I decided to figure out just how far along I was. When I realized that I was only about a third of the way done, I was slightly crushed. At this rate, it’s going to be a quite some time before i take my last stitch on this quilt. Wow! Stunning! Those are awesomely tiny stitches – i’d go blind doing that. I will have to find a way to take this class next time. 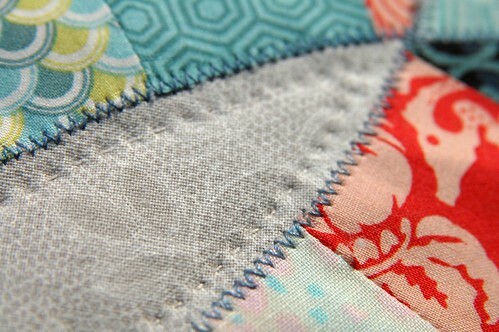 I really love the colours, and what you did with the back of the quilt, so very very much! I love it – especially how it looks so modern – most of the time I see the double wedding ring they feel dated – but your colors and placement – looks lovely. I adore it!! So pretty! My in-laws just brought us back a quilt from Newfoundland and although it’s pretty, it is no match for yours. Seriously beautiful. beautiful quilt with lovely colours! i love it! and i’m so inspire to try my hand at making a quilt, too. watching your progress is so fun! this quilt is Beautiful! i’m glad you brought it out to show us all. thanks for the birthday wishes karyn! the quilt looks amazing. it makes me want to quilt! i’m waiting for your next blog post!!! can I ask you a question Karyn! When you hand quilt, are you using a frame? I’m dying to start hand quilting but I’m intimidated by the frames and if I need one and the amount of space the big ones take up! I’m *so* inspired by your quilts, they look gorgeous! amazing texture and color combination. Loved it. I never got started with one of those. No patience to get it going i guess!